Disclaimer: This material is being kept online for historical purposes. Though accurate at the time of publication, it is no longer being updated. The page may contain broken links or outdated information, and parts may not function in current web browsers. Visit the NASA Salinity website for more information. 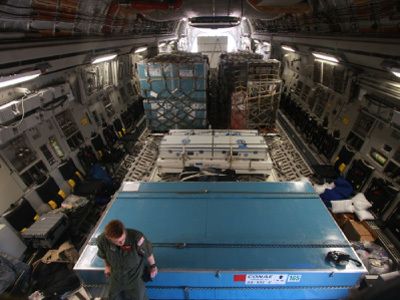 [26-Mar-11] The C-17 on-load in Sáo José began at about 08h20 this morning, and was completed at 10h10. The C-17 flight took off for San Juan, Puerto Rico at 11h30. The flight landed in San Juan, Puerto Rico at 17h45 local time. Loading of the second shipment onto trucks was completed this afternoon. The container carrying the observatory has been loaded onto the transport truck and remains secured inside the airlock at INPE-LIT. The team rests tomorrow (no work planned). The second flight is expected to arrive at 22h30 tomorrow (27 Mar). On-load for the 2nd flight is expected at 08h00 on Monday (28 Mar), but this will be updated after the arrival of the second flight tomorrow evening (27 Mar).